Let’s face it—daycare and after-school care are a fact of life for most families today. To make ends meet, both parents must work and need quality childcare for their pre-school aged kids while they are at work. This can be more challenging for single parents, who have even less income to put towards the cost of daycare. To meet the demand and the keep their services affordable, some daycare centers cut corners and create unsafe environments for the children they are supposed to be protecting. When choosing a daycare provider, it can be hard to know if the facility is a safe place for your child. Our children are the most vulnerable members of our society. The Button Law Firm has a passion for keeping kids safe and holding caregivers accountable for every child they harm directly or through negligence or incompetence. Not only are we committed to making sure the injured child is compensated for his suffering, but we also want to send a message to the childcare provider that we will not accept dangerous conditions that harm children. When your child is injured or neglected in a daycare facility, call us for the legal help you will need to seek justice for your child and to make our community safer for all children. Inadequate staffing. Texas law limits the number of children a daycare worker may supervise. This ratio changes as children get older and become more able to care for themselves. For example, daycare workers may not supervise more than four babies aged 0–11 months, but may be in charge of 15 3-year-olds and 26 6-year-olds. Even if a daycare center is in compliance with these requirements on paper, it doesn’t mean that at any given moment, workers are not supervising more children than they legally should. Unqualified workers. All daycare workers in Texas must pass a background check and meet minimum requirements, including having a high school diploma and completing eight hours of pre-service training. If a child is injured while in the care of a childcare worker who does not meet these qualifications, the daycare center can be held liable for knowingly endangering your child. Unsafe facilities. The state of Texas has an extensive list of required safety practices for daycare centers covering everything from furniture and equipment to handwashing and severe weather. When a child is injured by an unsecured bookcase or broken playground structure, the daycare center can be held liable. It is the center’s responsibility to conduct regular safety inspections and to correct any violations that could harm a child. Criminal acts. When a child is purposely hurt by a childcare provider, that individual may face criminal charges and the daycare center—as his or her employer—may also be held responsible. Even if an employee has passed a background check, if he or she physically or sexually abuses a child, both the employee and employer can be held accountable. Getting a call in the middle of the day from your child’s daycare center informing you that your child has been injured—or worse—is a parent’s worst fear. However, discovering bruises or broken bones on your own—or hearing about abuse or neglect from a verbal child—is even worse. In these cases, the daycare center is either ignoring an incident and hoping it goes away or is unaware that anything even happened to the child. In both instances, the caregivers should be held accountable. 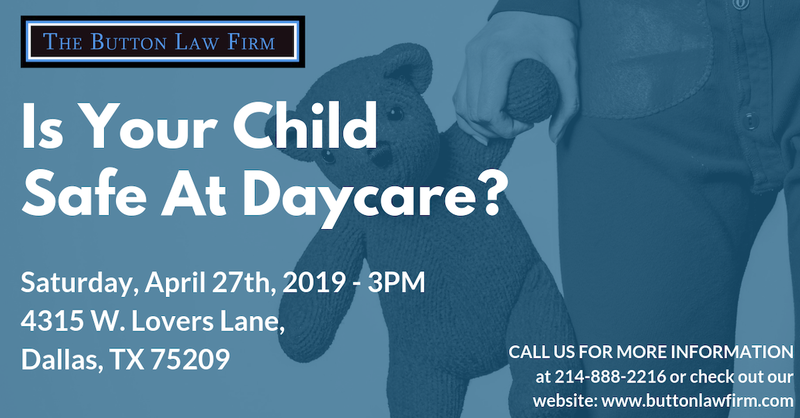 If your child was injured in a private daycare or after-school care center in Texas, contact the experienced daycare injury legal team at the Button Law Firm. We represent children from all over Texas, including but not limited to West Texas, Houston metroplex and the Dallas metroplex. We are dedicated to protecting children from harm, and we will make sure the daycare center and childcare worker responsible for your child’s injury are held accountable. Connect with us through the link on this page or call us at 214-888-2216.